Three hundred years before the events of Game of Thrones, Aegon the Conqueror and his sisters, Rhaenys and Visenya, took Westeros with fire and blood. One by one, the Seven Kingdoms fell to them, some more easily than others. Among those that did not come easily under the dragon’s command was the Kingdom of the Reach, or what is now much of the south of Westeros. The Gardener King’s defiance sparked the wrath of the Targaryens, and they, and their armies were burnt to a not-so-defiant crisp. The Reach King’s steward, a man with the surname Tyrell, surrendered to the Targaryens, and was, in return, granted wardenship of the south. Thus was the Tyrell family raised to the board of great houses, and joined the list of players, with a battle known as the Field of Fire. It is poetic that an eerily similar battle comes right after their fall. 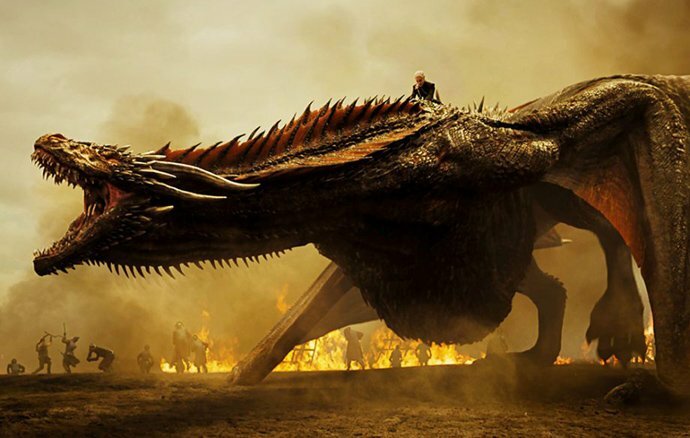 The Lannister armies, rich from the spoils of the sack of Highgarden, come under flaming attack by Daenerys (riding Drogon) and her Dothraki. The battle seems pretty one-sided, even with Bronn manning Qyburn’s dragon-defeating scorpion, and it ends with a bit of a cliffhanger, Jaime floating, seemingly lifeless, in the river after a near-brush with death by dragon. The Lannisters, previously the ascendant house, have found the tables turned against them by a very stubborn, hands-on Dany, though at what cost this victory comes for her is still an open question. She does have an injured dragon on her hands, and a black mark on her slate as far as "not killing" is concerned. 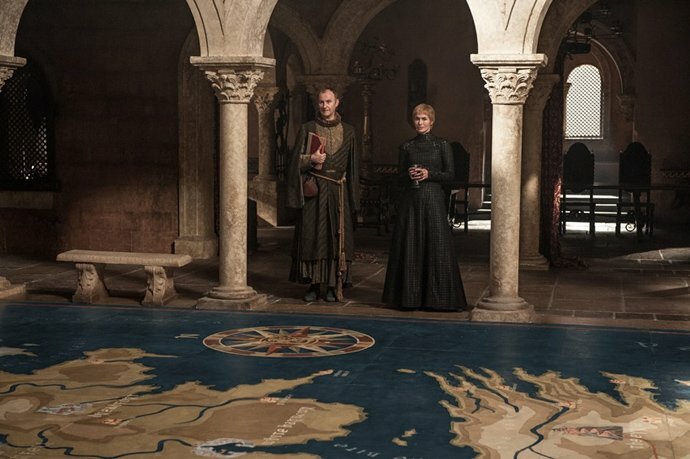 The title of this episode, "The Spoils of War", might be a literal reference to the gold that doomed Highgarden, but it could also be read as a nod to the major battle that still lies ahead: the battle for the survival of mankind. We often forget that Westeros itself is the spoil of a much older war between the Children of the Forest and the First Men. It was as a result of this long-drawn-out conflict that the White Walkers were created. Jon, who does not know this particular story (only Bran is privy to it, for now), finds a series of paintings within the caves of Dragonstone, paintings that show the First Men and the Children working together to defeat a common enemy. He shows it to Daenerys, who instead of being impressed into throwing up her previous concerns and joining hands with Jon, tells him bluntly that, since he is so fond of preaching about the common good and setting aside personal vendettas, he might as well do it himself and bend the knee to her. If he does, she will help him and the other Northerners fight the Night King. Needless to say, Jon, never exactly a smooth operator, is nonplussed and disappointed. The other spoils of Westeros’ current war (still the War of the Five Kings, only its metamorphosed now into the War of the Two Queens and One Brooding King in the North) are reflected in the Starks. All the surviving Stark children are now gathered in Winterfell, and each of them bears gifts, or burdens, depending on how you look at it, that are the results of their personal traumas and journeys. Bran, no longer able to emote even to thank Meera, who came close to death so many times for his sake, is fully subsumed in his role as the Three Eyed Raven. Sansa is enjoying her role as Lady of the Keep, but her political skills too have come at a grave personal cost, and Arya’s powers as an assassin, though quite satisfying for viewers who have long rooted for her, are also the product of a terrible, often lonely journey that no one (ha, see what I did there?) should have had to undergo. Sansa’s reunion with Arya is as uncomfortable, in some ways, as her encounter with Bran; she sees what her sister has become, and while her own skills delight Arya (obvious during her sparring with Brienne), how they have come about, and what they portend, are questions that appear to trouble Sansa. Her siblings’ returns are not entirely unmixed pleasures, after all. We also paid little visits to Theon, who has returned to Dragonstone to beg Dany’s help only to find her gone (flying off to aforementioned Field), Cersei, who is keeping the Iron Bank firmly on her side in the ventures to come, and Baelish, who is maintaining his more cryptic than usual run this season by handing Bran the very dagger that was meant to kill him. The identity of the real owner has been a mystery for a very long time now. Baelish himself declared the dagger belonged to Tyrion Lannister, thus setting in motion the events that led, eventually, to the War of the Five Kings, spiralling to where we are today. "Chaos is a ladder," Bran creepily reminds him, and the widening of Baelish’s eyes, a rare occurrence, shows that he, a man who fights everyone, everywhere, and prides himself on not being surprised, is taken aback by this boy’s words. We can finger Baelish as one of the chief designers of this grand chaos that plagues Westeros; the question still remains: what exactly is he doing now? Will the same dagger that started the storm over the continent be the device that ends it, and if so, how? A bead of poison, a finger wrongly pointed, a child climbing an ivy-covered tower and seeing what he should not see. By such small acts are the game of thrones begun, and by such small acts, perhaps, ended.